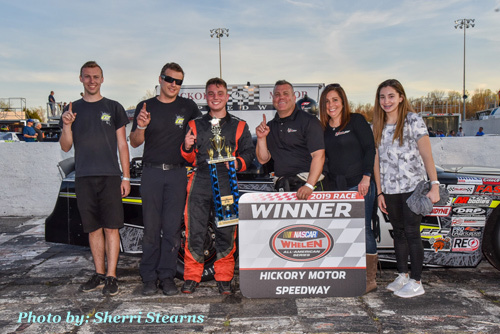 " Midas and Watson split Twin 40s "
4/6/19 - The wonderful sounds of horsepower rang out through the Catawba Valley on Saturday night as the NASCAR Whelen All-American Series roared to life for another eventful evening of racing enjoyment. Leading off the night's racing would be the NASCAR Whelen All American Series Late Models in their first of two 40 lap features. Kevin Leicht in the #25 would set the fast time in qualifying to grab the top spot with a 15.02. Vince Midas in the #14, the #1 of Brody Pope and Thomas Beane in the #31 would start 2 nd through fourth respectivly with all three competitors running a 15.03. The start would see the front pair side by side for several laps until Leicht would nose ahead for the early lead. Battles would rage throughout the field, but the chaos would be controlled as the caution flag would stay in the flagman's holster. Midas would start chipping away at the lead and move under Leicht to battle for the top spot. Both drivers would give each other plenty of room to battle side by side for the top spot. Midas would finally move ahead for the top spot around the mid-point of the forty lap feature. Pope, Beane, and Chris Hudspeth in the #28 would give chase to Leicht for the second spot. 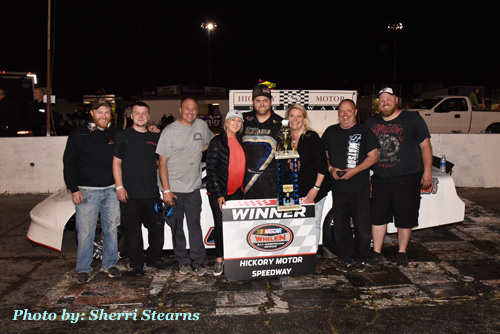 Midas would hold on and grab his first Hickory Motor Speedway Late Model Victory. Pope would move up to finish a strong 2nd with Beane finishing 3rd. Hudspeth would move up to finish 4th and Leicht would hold on for 5th. Next up would see the fan-pleasing Hickory Vintage Racers hit the track for 25 laps and open up their 2019 season. The front row would be a family affair with dad, Tim Gilbert in the #95, grabbing the pole and son, Eddie Gilbert in the #00, starting second. The green flag would see the Gilbert's battling side by side for the top spot. The caution would fly when the younger Gilbert would spin in turn 1 of the second lap. Mechanical problems would cause the spin and side line Eddie Gilbert for the remainder of the event. The restart would see Tim Gilbert at the point with Bob Hapeman in the #8 starting second. Gilbert would move to the lead with Hapeman close in tow. The caution would fly on lap 15 after contact between the #83 of Tom Fenn and #90 of Dennis Hinkle would send them both spinning. Unfortunately both cars would leave the racing surface on the hook of the wrecker. The restart would see Gilbert move back to the front for the 10 lap dash to the finish. Gilbert would hold on for the remaining laps and return to victory lane with Hapeman finishing 2nd. 83 year old, Bill Webb in the #16 would finish 3rd, 2018 Hickory Motor Speedway Champion, Bill Powell in the #71 would finish 4th, and Mackie Webb in the #16 would finish 5th. The Paramount Auto Group Limited Late Models would roll off next for 35 laps of side by side action. Todd Midas in the #50 would make a big 2019 Hickory Motor Speedway return by grabbing the top qualifying spot while Josh Kossek in the #44 would be close behind in second. Cody DeMarmels in the #18 and Kosma Guznyakov in the #33 would make up row two. The green flag would see the front row battle door to door through turns 1 and 2. Kossek would nose ahead down the backstretch. DeMarmels would see the inside open up and move under Midas for second. Kossek would lead for several laps until he would get pressure from DeMarmels for the top spot. DeMarmels would move around to the point and send Kossek to second. DeMarmels would set sail in the lead with the battle being for second between Kossek and Midas. Midas would finally move around for the position and set his sights on the leader. DeMarmels would prove too tough and drive on to the win, his first in Limited Late Models at Hickory Motor Speedway. Midas would finish 2nd and Kossek would come home in 3rd. Ben Campbell in the #27 would finish 4th and Guznyakov would finish 5th. Hitting the famed 3/8 mile oval next would be the 4-Cylinders for 25 laps of battle. 2018 Hickory Motor Speedway Champion, Brian Mundy in the #6, would start from the point with the #25 of Dennis Ward to his outside. Ward would move to the early lead as Mundy would pull in with mechanical issues after a hugely successful 2018 season. Cody Combs in the #9 would move to second and set his sights on the leader but the #29 of Allison Houston in third would also have a plan. Ward would drive on to the win with Combs bringing it home in 2nd. Houston would finish 3rd, Robbie Trivette in the #11 would finish 4th, and Mundy would finish 5th. Roaring to life next would be the Street Stocks for their 30 lap feature. Drew Cox in the #21 would continue on his hot hand, after winning last week's race, and grab the top spot in qualifying with Mark Whitten in the #77 to his outside. The start would see the front pair side by side with Cox moving to the lead after the first couple of laps. Positions would change hands throughout the field, but stay under green till a spin involving Marshall Sutton in the #64 and Jesse Clark in the #5 would bring out the caution on lap 15. Both drivers would be able to continue. The restart would see Cox at the point with the #16 of Jonathon Smith starting to his outside. As the leaders would come under the green flag they would make contact and see the leader, Cox, spin. The caution would once again fly and see the field bunched for the restart with Cox coming from the rear. The restart would see Smith and Whitten duel for the top spot. Smith would nose ahead with Whitten tucking in close behind. Cox would work his way back up to third when contact with the #03 of Kevin Eby on lap 22 would send him spinning and bring out the caution once more. One final restart would set the stage for a furious battle for the win. Smith and Whitten would restart side by side and see Smith once again pull to the front. Smith would hang on for the win, the third different Street Stock winner for the season. Whitten would hold on for 2nd and Cox, who would battle his way from the back a second time, would finish 3rd. Ethan Johnson in the #2 would finish 4th and Eby would take 5th. Closing out the evening's festivities would be the NASCAR Whelen All American Series Late Models for the second of their 40 lap features. After the invert from the finishing order of race one the #34 of Pat Rachels would start from the point with Neil Meredith in the #36 to his outside. Row two would see Charlie Watson in the #9 and Connor Mosack in the #18. The green flag would see Rachels and Meredith dueling it out for the lead. Meredith would nose ahead and Watson would look to move around Rachels for second. After several laps Watson would look under Meredith and make his way to the top spot. Watson would set a torrid pace while Thomas Beane in the #31 would quietly work his way into second place and start chipping away at the leader. The caution would fly on lap 33 when the #25 of Ryan Vargas would spin in turn one. The restart would see Watson, Beane, and the entire field bunched up for a seven lap shootout. Watson and Beane would look to battle it out between themselves until race one winner Vince Midas in the #14 would enter the fray and look to go three wide with the front duo. The action would settle down as Watson would pull ahead. Watson would drive on to a close but hard earned win. Beane would finish 2nd with a good points night and Vince Midas would cap off his night by finishing 3rd. Rachels would hold on for 4th in a photo finish with Brody Pope in the #1 who would finish 5th. Next week the NASCAR Whelen All American Series will be in action once again with Twin 40s for the Late Models, Round #3 of the Paramount Kia ‘Big 10' Racing Challenge with 50 laps for the Paramount Auto Group Limited Late Models, 30 laps for the Street Stocks, 25 laps for the 4-Cylinders, and 20 laps for the Renegades. Gates open at 4:45pm, Qualifying at 5pm, Autograph Session at 6:15 pm, and Racing at 7pm. Tickets only $12.50 for Adults, $10.50 for Teens and Senior Citizens, Children 12 & under are FREE! In two weeks, on Easter weekend, April 20th, the PASS Series returns for the annual Easter Bunny 150. Don't miss the great Super Late Model action.